I learned how to make crepes when I was just a little girl, and now my children carry on the tradition. To make crepes, you need to have a basic crepe maker. We have a large family so we bought four crepe makers. It keeps them coming faster. Place all the ingredients in a blender or mixer and beat well. For more perfect crepes, let the batter sit for one hour. We usually don’t wait; we just start making crepes. The first few crepes are light and foamy, but we still like them. If your crepe maker comes with a dipping pan, pour the batter into the dipping pan. 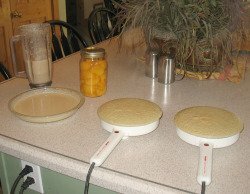 If your crepe maker doesn’t have one of these, you can use a round pie pan. Heat the crepe maker up before dipping it into the batter. Tip the hot crepe maker over and let it sit in the batter for a couple seconds. Then let the crepe maker sit on the counter while the crepe cooks. When the crepe starts getting slightly brown around the edges, it’s done. I just quickly loosen up the edges with my fingers and pull the crepe off the pan. The children use a spatula to loosen the sides because they burn their fingers. Do whatever works for you. Use large or extra large eggs in the recipe. The eggs help hold the crepes together. I usually make at least a double batch so I use 7 eggs instead of 6 in a double batch. 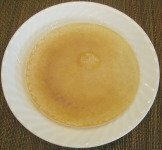 If the surface of the crepe maker gets oily, the batter won’t stick. Use a paper towel to rub off the excess butter before dipping the pan into the batter. Our favorite topping for crepes is canned peaches. In the summer when the raspberries and blackberries are producing, we like to put them on the crepes. We love to eat the crepes just plain. You can put any topping you like on them. They are pretty basic and go with almost any flavor.